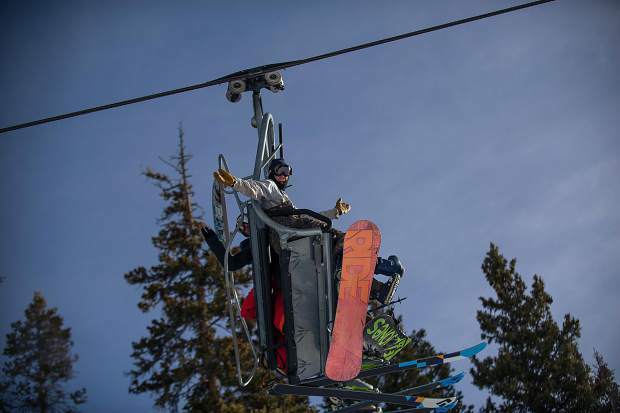 James Harvey, right, getting first chair on the Aspen Silver Queen Gondola for the start of the season on Aspen Mountain for opening day this Thursday. 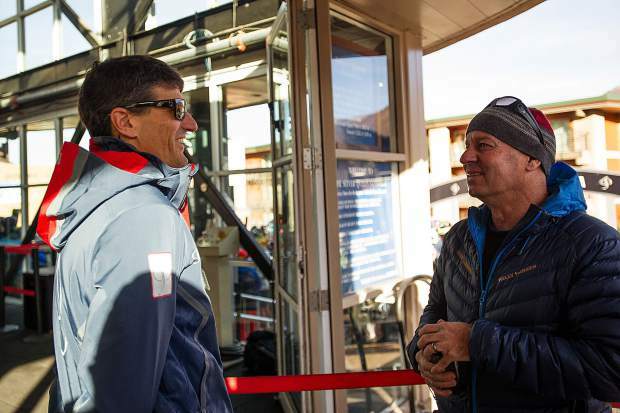 CEO of Aspen Skiing Company Mike Kaplan, left, and Director of Public Relations Jeff Hanle stand at the Silver Queen Gondola for opening day of Aspen Mountain on Thursday. 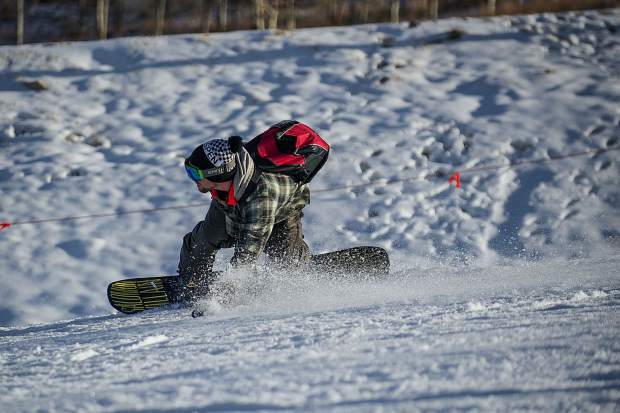 A snowboarder gets low coming down Fanny Hill in Snowmass for their opening day on Thursday. 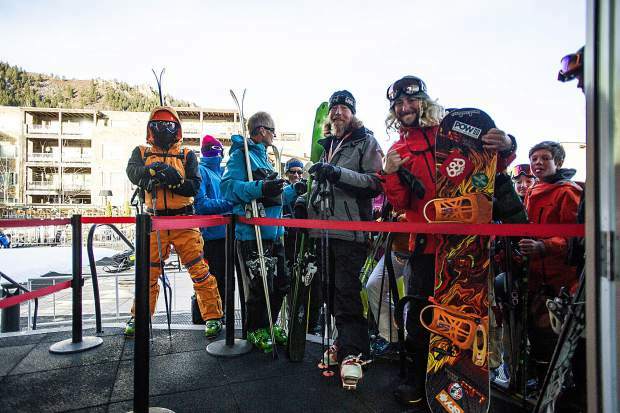 First person in line for first chair this morning James Harvey loads his snowboard into the gondola on Aspen Mountain for opening day this season. 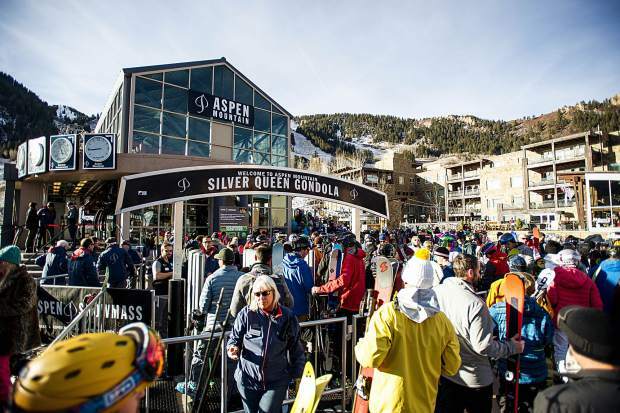 Skiers and snowboarders filter through the lines at the Silver Queen Gondola on opening day at Aspen Mountain on Thursday. 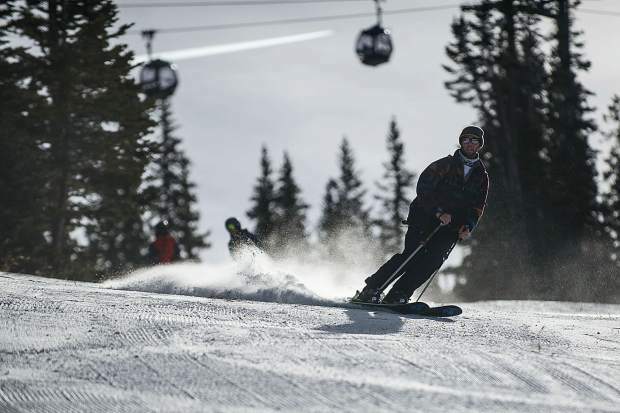 A skier pops off a side feature on Aspen Mountain on opening day on Thursday. 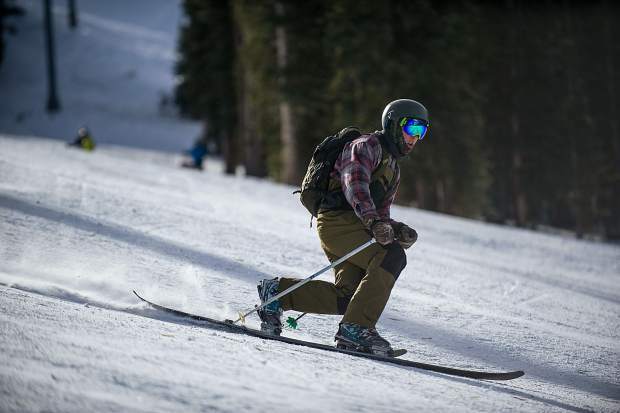 A skier makes his way down Aspen Mountain on opening day on Thursday. 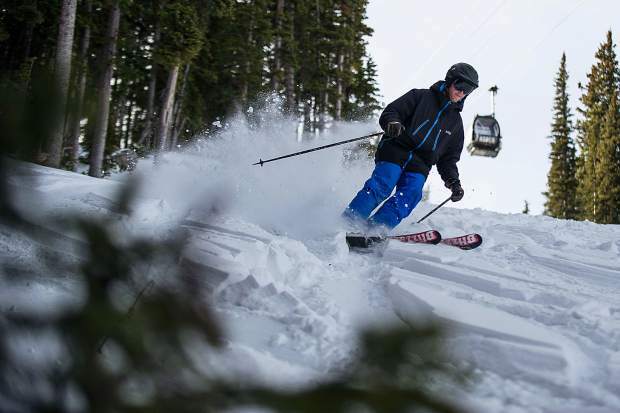 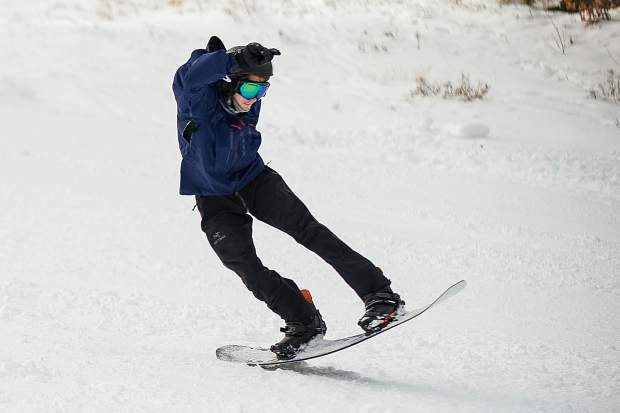 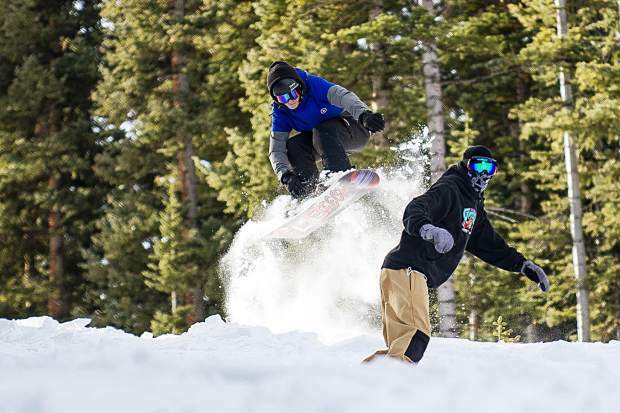 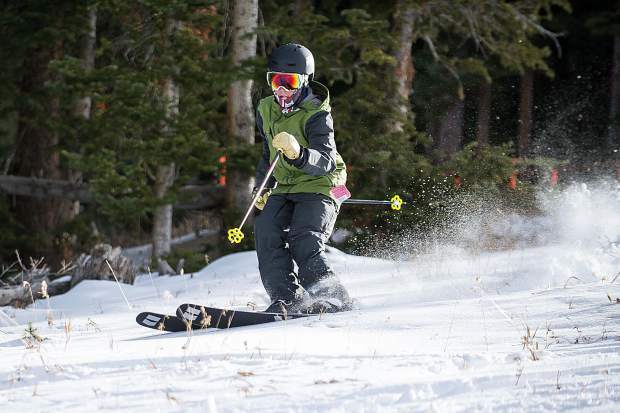 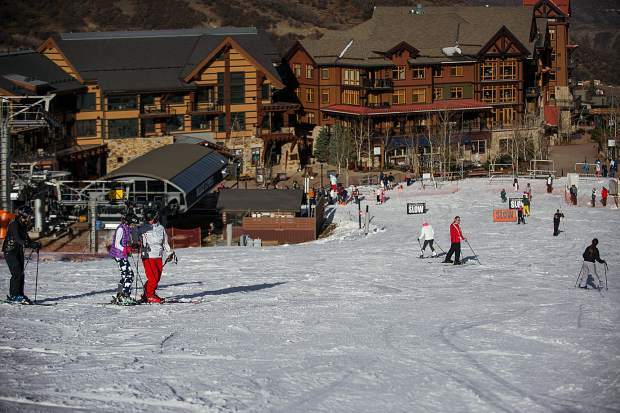 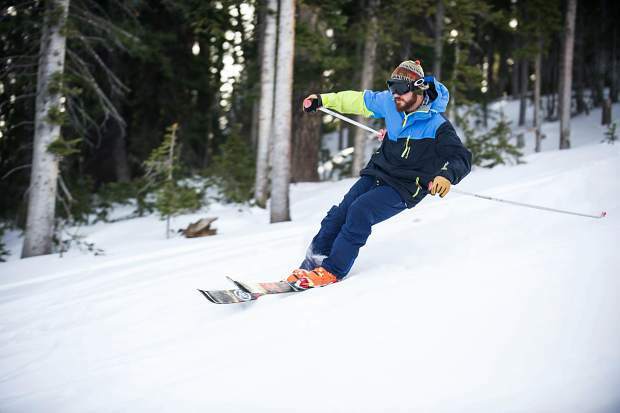 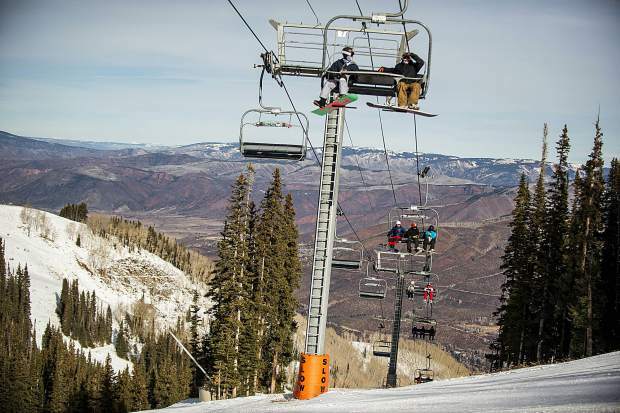 Skiers and snowboarders ride up the Ajax Express on Aspen Mountain for opening day Thursday. 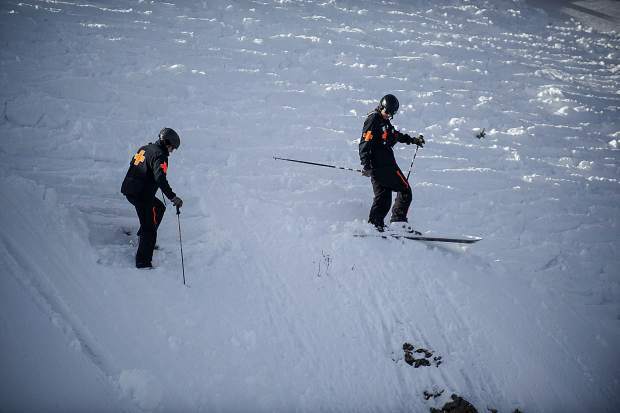 Aspen Mountain ski patrollers side step on Dipsy Wall on Aspen Thursday on opening day. 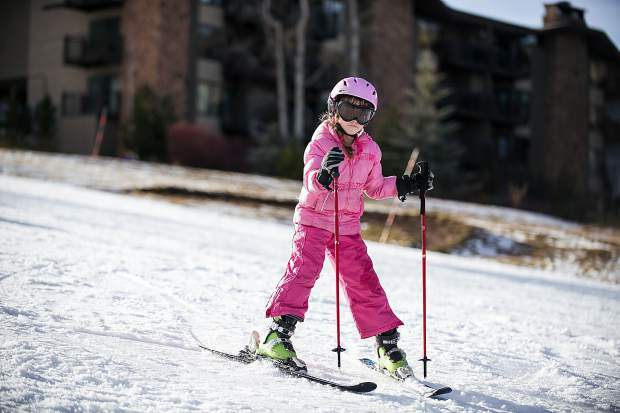 A little skier makes their way down Fanny Hill Thursday afternoon of Snowmass Mountain's opening day. 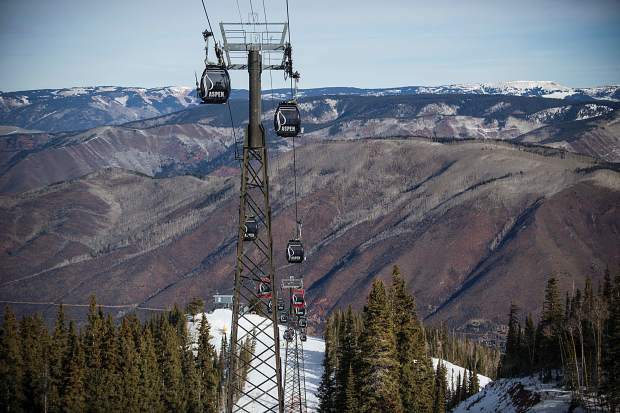 Riders going up the Ajax Express on Aspen Mountain on Thursday for opening day. 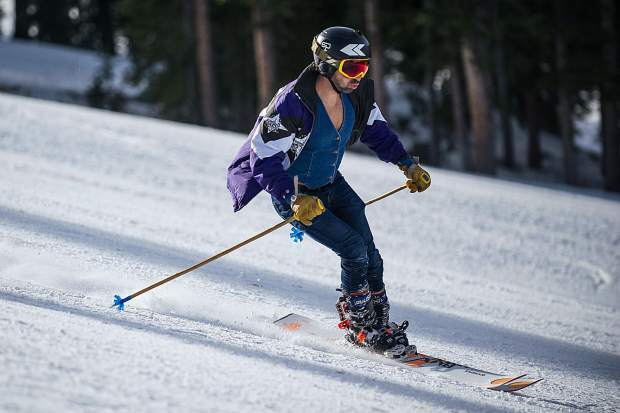 A teleskier makes his way down Aspen Mountain on opening day on Thursday. 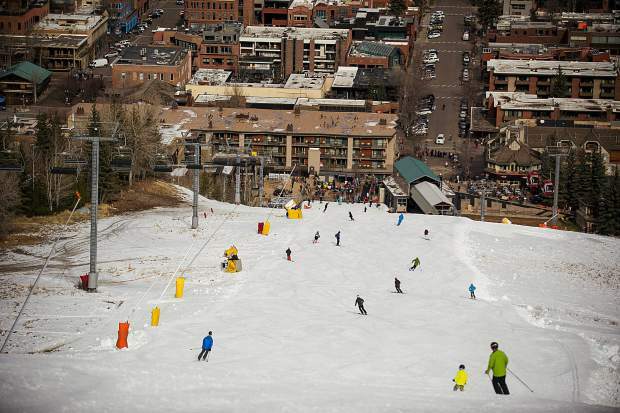 Skiers and snowboarders make their way down Fanny Hill Thursday afternoon of Snowmass Mountain's opening day. 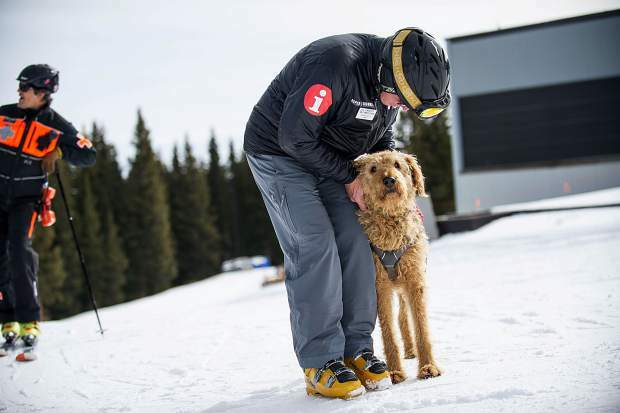 Zoot the Aspen Ski Patrol dog gets some love from Stephen Smith on opening day this Thursday. 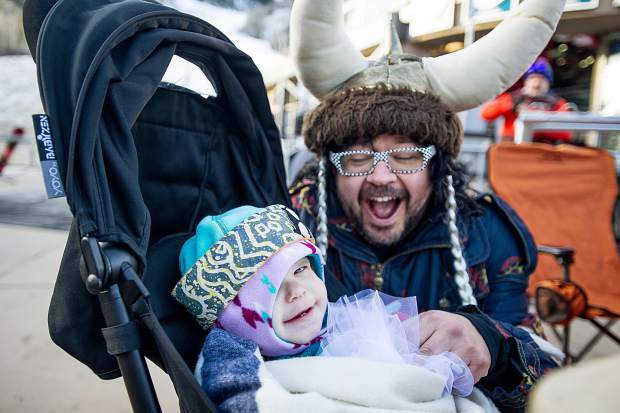 Hardy Wallace and daughter Maple, 16 months, are all smiles at the celebration of life for "Live Like Angus" at the base of Aspen Mountain on opening day this Thursday. 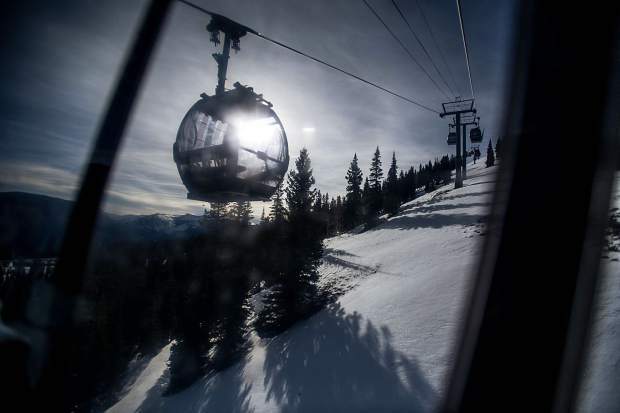 The Silver Queen Gondola running on opening day on Aspen Mountain this Thursday. 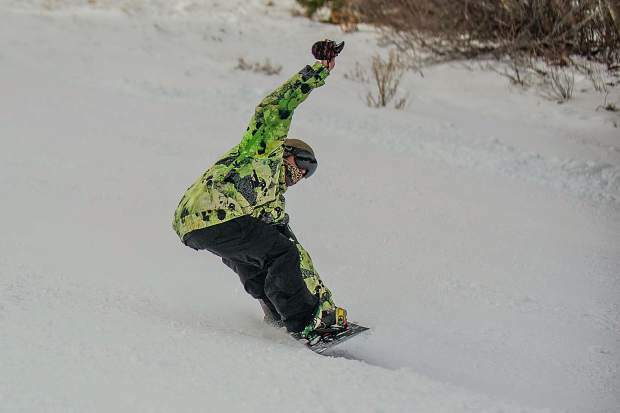 A snowboarder holds a grab on the Little Nell run on Aspen Mountain for opening day Thursday. 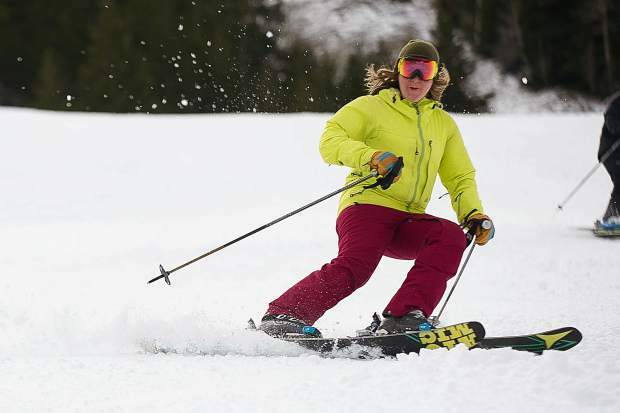 Jackie Welgos coming down The Little Nell run Thursday for opening day on Aspen Mountain. 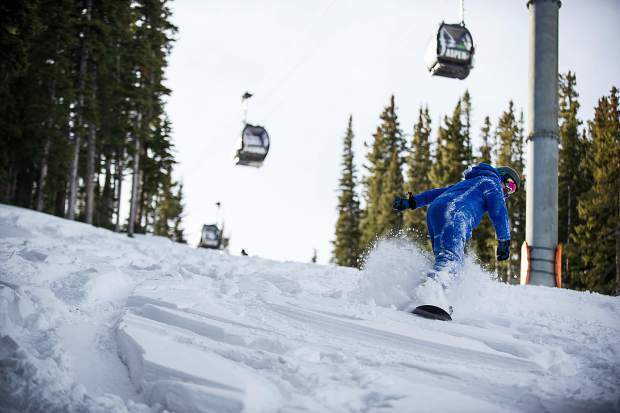 A snowboarder makes his way down Aspen Mountain on opening day on Thursday. 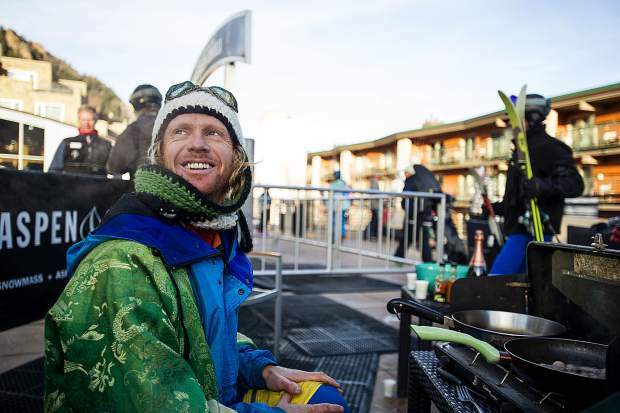 Nick Devore smiling at the celebration of life for "Live Like Angus" at the base of Aspen Mountain on opening day this Thursday. 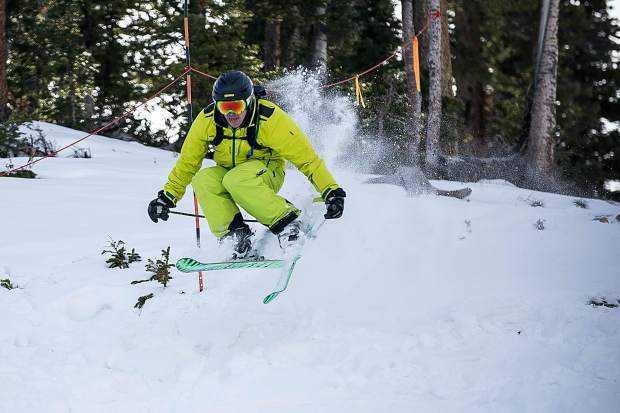 A snowboarder does a 180 on the Little Nell run on Aspen Mountain for opening day Thursday. 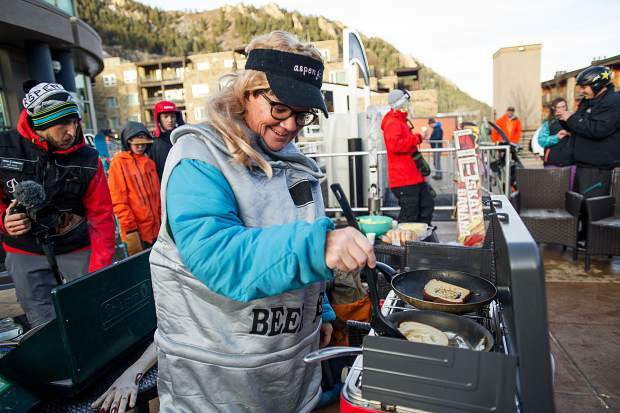 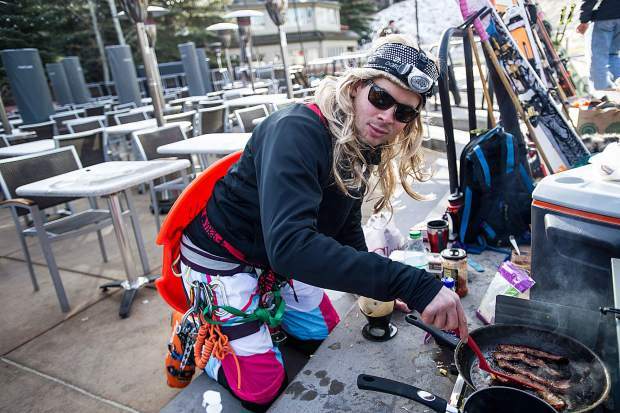 Swiller cooks up some breakfast at the base of Aspen Mountain for the "Live like Angus" celebration at opening day on Thursday. 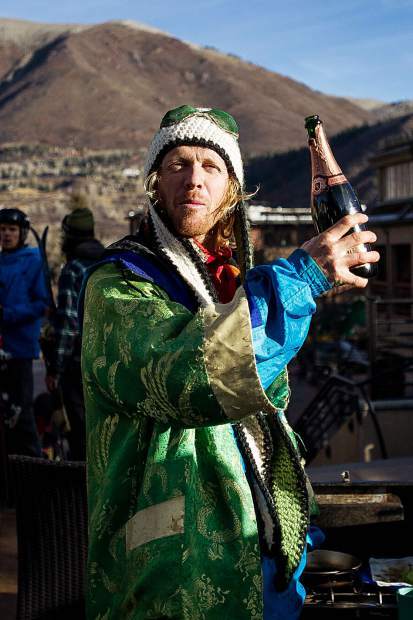 Nick Devore enjoys some champagne at the celebration of life for Angus Graham or "Live Like Angus" party at the base of Aspen Mountain for opening day Thursday. 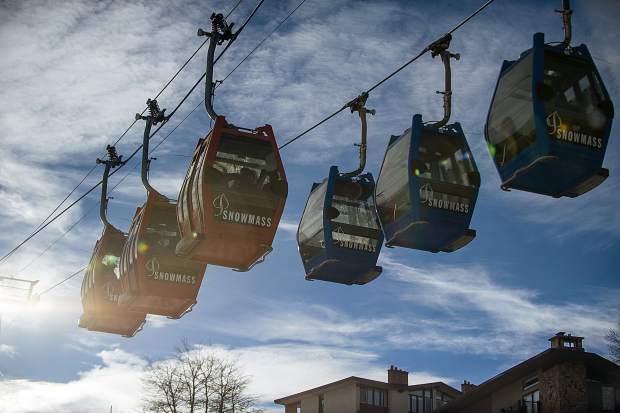 The Skittles gondola in Snowmass was the mode of transportation for skiers on opening day for Fanny Hill runs at Snowmass on Thursday. 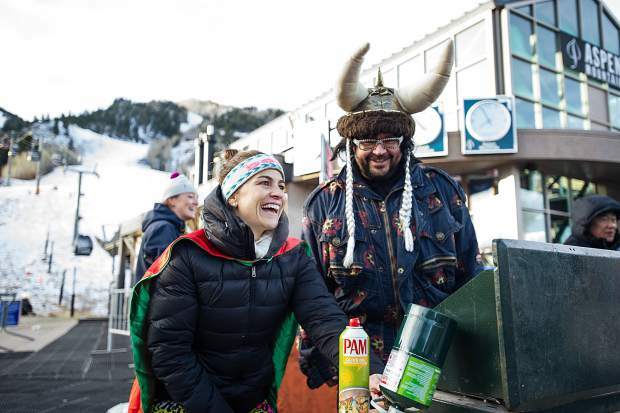 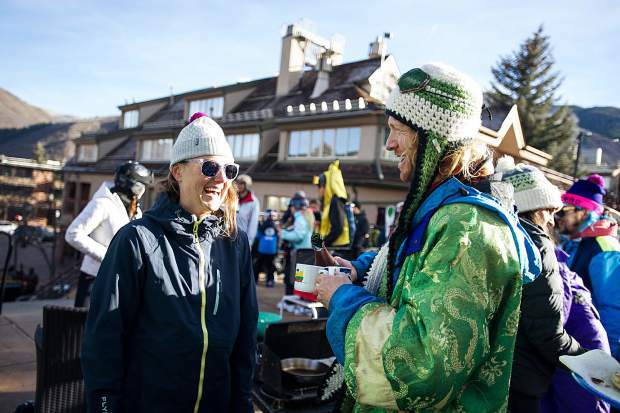 Nick Devore and Catherine Bell have fun at the "Live Like Angus" event at the base of Aspen Mountain for opening day Thursday. 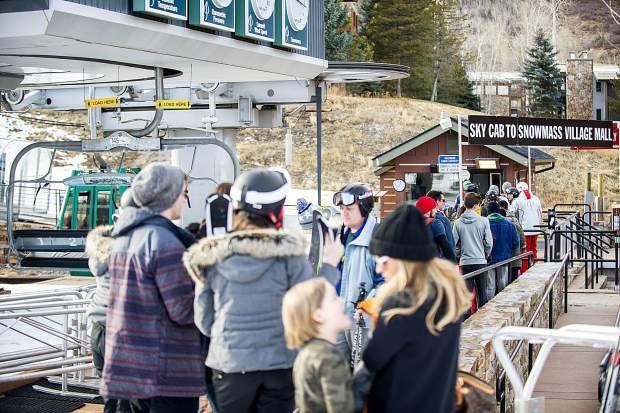 The line for the Skittles gondola at Snowmass for their opening day Thursday. 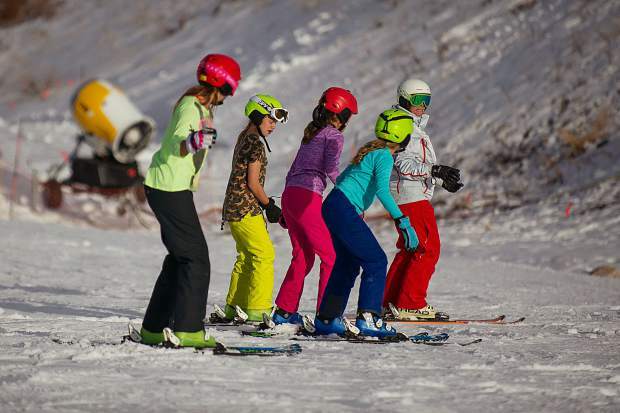 Ski school makes their way down Fanny Hill Thursday afternoon of Snowmass Mountain's opening day. 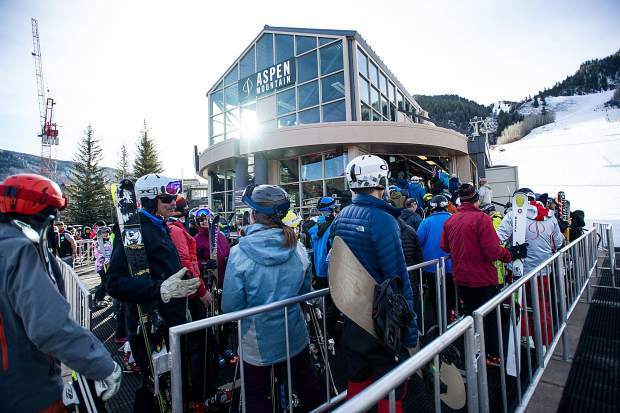 Crowds gathered at the base of the Silver Queen Gondola on Aspen Mountain for opening day on Thursday. 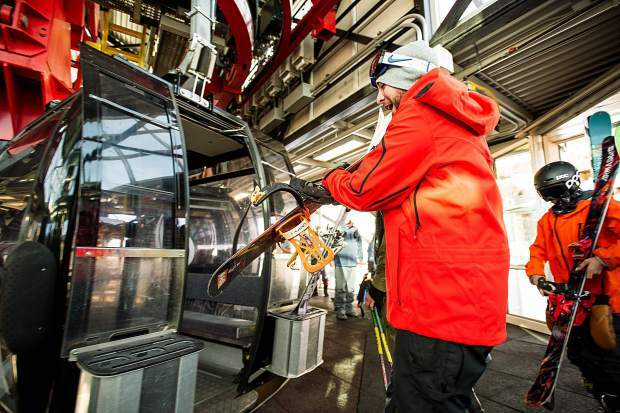 The Silver Queen Gondola on Aspen Mountain on Thursday for opening day. 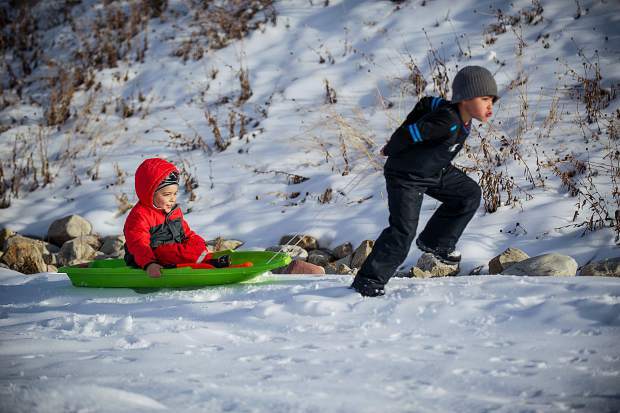 Julian Mirabal, 6, pulls his brother Christian, 4, in a sled next to Fanny Hill on Snowmass for their opening day on Thanksgiving. 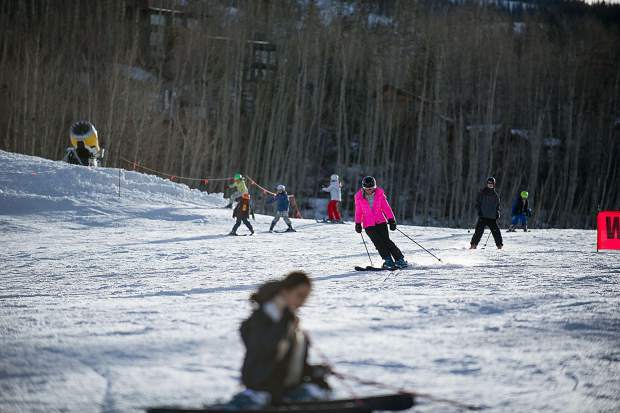 Skiers and snowboarders make their way down Aspen Mountain on opening day on Thursday. 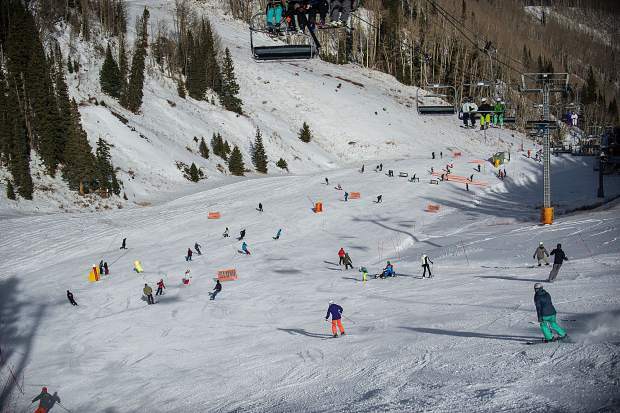 Skiers and snowboarders finish their top to bottom runs on the Little Nell run on Aspen Mountain for opening day Thursday. 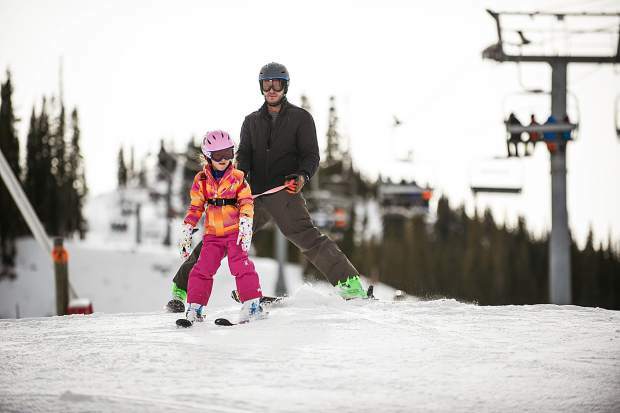 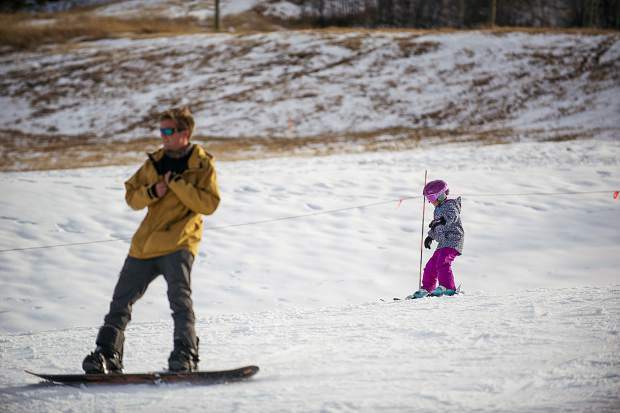 A dad and daughter ski down Aspen Mountain on opening day Thursday. 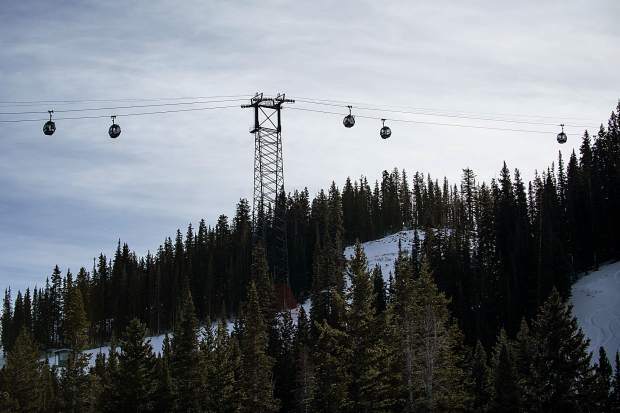 With 100 acres and top-to-bottom skiing, Aspen Mountain opened Thursday and the skiers and snowboarders came out. 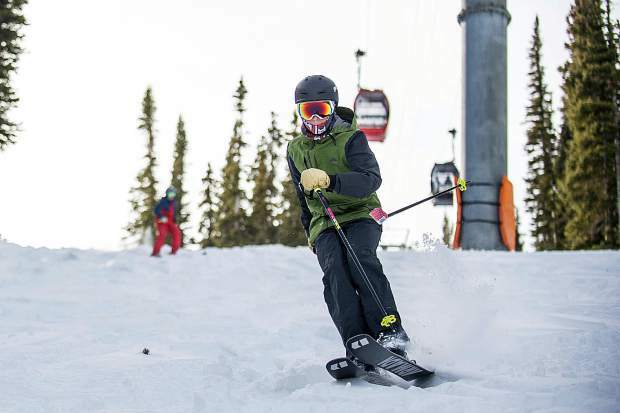 It was a sunny day on the top of Ajax, and more of the same weather is expected through the rest of the Thanksgiving weekend. 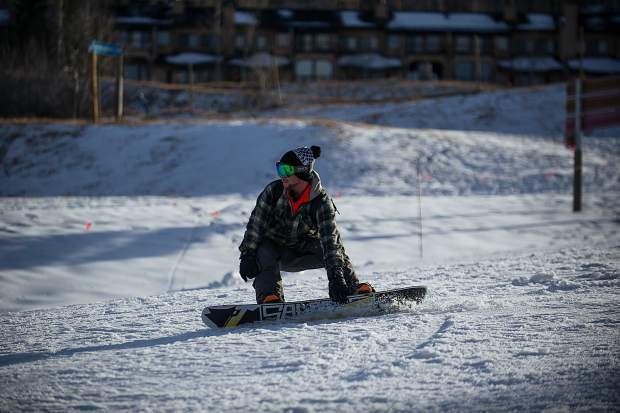 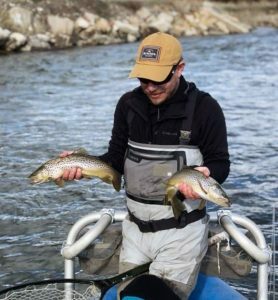 Check out more photos and a video on opening day at http://www.aspentimes.com.